Many people have heard about the glowing earthworms in New Zealand, but there’s also a small town outside of Macon, Georgia that is locally famous for having them. Normally, you can only commonly see creatures like this in Australia, but underground in Georgia you can get a peek of these glowing worms up to two feet long! Buried deep in the earth of Hawkinsville, Georgia lives an extra mysterious kind of earthworm. What makes these slithering creatures different from the rest is that they emit a sticky slime that glows blue made up of the same chemical that lights up fireflies. Just an hour outside of Macon, at the lake at Mile Branch Park in Hawkinsville is the best opportunity to see the glowing worms. Beneath the surface, something slithers. And if you find it, prepare to be slimed and glowing. 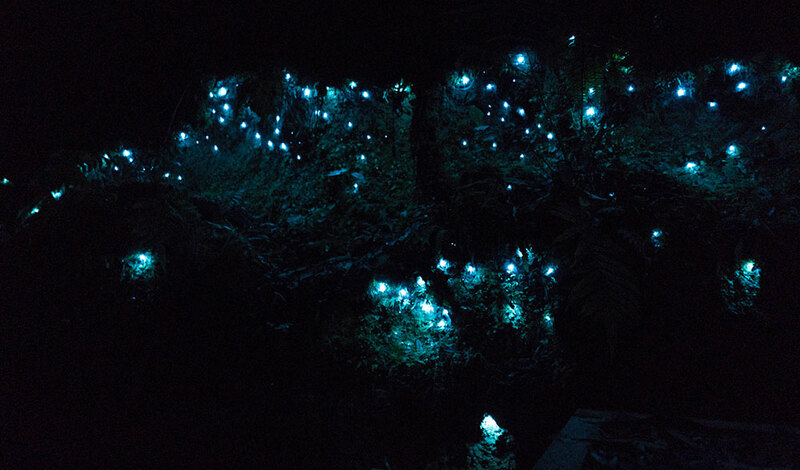 Local residents say that you can hammer a steak into the ground to cause vibrations that attract the blue, glowing worms. Worms will likely come to the surface and this practice is called “grunting.” The worms will surface for collection, and you’ve got everything you need to go night-fishing. This park also has a nature trail with labeled tree species, a boat ramp, and picnic shelters.